Here we have two seasons that have some very powerful and serious stories to them. Two seasons which have great character development and world building. Time Force also brings forth my favourite villains from the series, and hits the top with many things I like from the franchise. 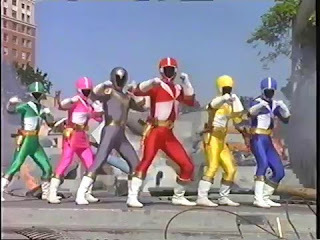 Lightspeed Rescue has a strong start, and manages to introduce the major elements in the first episode. Stunt pilot Joel, rock climber Kelsey, water park performer Chad, and firefighter Carter are recruited by Lightspeed to tackle the demons that have risen once again. The base is underwater, as that is the one place the demons cannot travel. The demons expect their queen to be waiting at their castle, but all they find is her son. The episode shows all of these, but does little to explain them, and that works to keep the pace brisk. There's time for explaining stuff when focus is placed on them. Joel at first is wanting nothing to do with this plan, but once the monitor shows the demons destroying the city, all of them are willing to help. The fifth Ranger is Dana, the captain's daughter. The monster is tackled, along with some Batlings, and the Rangers are cheered by the watching audience. That is something Lightspeed Rescue is the first series to do - have the entire team of Rangers not hide their identities. The second episode puts the rescue in Lightspeed Rescue, and also introduces the zords and tech specialist for the season. It also acted as Joel's character test, as he has a thing for the tech specialist, though since he heads out for flowers instead of going to the induction briefing, doesn't realise who she is. Carter has to face the difference between obvious and right, Kelsey shows her stuff in rescuing a friend, and Dana has some trust issues with her dad. These first few episodes start to go deeper into what was set out in the opener, and I really like that the rescue theme is followed a lot. Joel and Ms Fairweather part two happens in the episode that introduces some new gear to the Rangers. Vypra - one of the demons - has a powerful vehicle that the Rangers are unable to stop. Joel is making advances on Ms Fairweather again, and she doesn't want him looking in on the project at hand. He gets it into his head that it's for him, and gets a shock when the Lightspeed Cycles are revealed. The Rangers make good use of those cycles to damage Vypra's vehicle. Cyborg Rangers come into the fight, and replace our team. Their electronics get ruined when struck with lightning, and they turn on their creators. The Rangers sort them out, though it gives a bit of insight into how they feel. Kelsey and Joel take their dismissal a bit personally, though still head to the rescue at Carter's calling. Dana is going to support the cause, and while Chad does so as well, at the minute he feels as though he is only here to fill the fifth space. Up To The Challenge fixes that by giving Chad his own episode, and fills out his character a bit more. He is shown to not get goaded into a fight, and willing to resolve a fight without attacking. The idea of someone bad turning good is followed in the next episode, where the demons decide its time to make a dormant volcano active. With Dana on a bus heading to the volcano, a criminal is on board as well, and in a moment of chaos is rescued by Dana and the bus driver. That criminal does the same for the others on the bus when he has to take over driving and manages to avoid the debris from a rock-fall. While he still gets arrested, he says he doesn't mind as he will come out a better man. The volcano is still active and the Rangers still need to do something about it. This is where they get the Super Train Megazord, which comes in handy for battling some monsters and stopping the volcano. The story is strong within those two episodes, and only gets stronger with the next topic at hand. The Titanium Ranger. Lightspeed are testing out the Titanium morpher, but Carter is unable to morph. It seems testing on this has been going for a while, as it is said it is too dangerous to continue. That night, the morpher is stolen. In their next battle, Vypra brings forth the Titanium Ranger, and the other Rangers are almost destroyed by his hand. They get recalled, and when in battle again with new V-Lancer weapons, the tables have turned. They have the chance to destroy him, but Captain Mitchell orders them to return again. The Titanium Ranger is his son, and Dana's brother. The story is told, about how Ryan was saved by Diabolico and his life signed over to him. Since that time, Ryan had been fed with stories of how his dad never cared for him. He learns the truth in a confrontation with his dad, when both are hanging from the same root as the night they were split. The root starts to give, and Captain Mitchell lets go to save Ryan. Ryan jumps and morphs to save his dad, but in the end gives up the Titanium power. He retakes it once he realises he had good inside him still. However, there's a complication. Ryan has been branded with a cobra curse, and each time he morphs, it moves further up his body. Once it hits his neck, he will be destroyed. It's powerful interactions within this family that make this arc so great. Everything feels well put together, and the pacing is great. We actually see the Titanium morpher get stolen, and the intruder looks upon the picture of the Mitchell family, hinting that a family crisis is to be started. Ryan decides to face the cobra curse head-on as Diabolico does the same with the Rangers. Ryan overcomes the curse and joins the Rangers to finally take down Diabolico. In doing so however, Queen Bansheera says that her son Impus will be their downfall. His first plan is to infiltrate the Aquabase, and to do that he captures four of the Rangers and transforms into each in turn to trick those of the Aquabase into thinking everything is fine. When the entrance opens up though, they realise what is happening and Impus is revealed - now under the new name Olympius. Carter runs Olympius through the emergency water breaker and ends up at the beach. His powers weakened, the other Rangers are released from him. The other demons arrive and retreat with Olympius, leaving behind a demon for distraction. Queen Bansheera returns, though only partially, due to the ceremony to bring her back being interrupted by the Rangers. Ryan leaves on a mission to find out how to capture the demons once and for all, and the plans to destroy the city get ever grander. As Olympius continues to fail, Queen Bansheera decides to transfer command to Vypra and Loki. Since Olympius overheard that, he takes them both out, and tells a story that they were destroyed by the Rangers. The two survive though, and end up at the tomb of the demons. There they reserrect Diabolico, and the three plan to get revenge. Ryan has seen this happen, and tries to warn the Rangers. Connection is spotty, though the Rangers find out for themselves anyway. Diabolico is wanting his star power back, which had been transferred to Impus upon his destruction, and a rivalry between the two begins. The team-up arc. Lost Galaxy and Lightspeed Rescue. Trakeena wants revenge on the Galaxy Rangers, and so plans to attack Earth. Using the power drained from captives, she hopes to return to her full-powered form. She also tricked Olympius into thinking it was for Queen Bansheera, and when he finds out her true plans, a blade is poisoned with the intention of poisoning Trakeena's energy tubes. Now, all of the first part I found good. It showed a personal issue, with a little girl's mom getting captured, no-one believing her, and Carter befriending this girl and helping her. The Galaxy Rangers are introduced throughout the two-parter, and there's a good sense of character, some good fights, and it is evenly paced in exploring the story. The second part felt as though it wanted to rush to the battles, then felt as though it rushed through the fights as well. A battle with Olympius and the demons happens first, with Trakeena morphing to her poisoned form in supersize. The zords are called, the Galactabeasts arrive and are taken out all too quickly, and the entire two teams fit inside the Omega Megazord with the Lights of Orion active to deliver the final blow. The ending scene shows Carter thanking the girl for all her help after being reunited with her parents, and it is sweet to see this scene end with Carter giving her a Lightspeed badge and saying she is officially a Junior Ranger. Ryan is looking for a sorcerer to read the ancient writing he found at the demon tomb, and Olympius wants to gain access to the shadow world, where the spirits of defeated demons lie. The sorcerer of the sands reveals himself to Ryan, and as Diabolico shuts Olympius in the shadow world, the sorcerer reads the sealing spell. Diabolico counters the spell and turns the sorcerer to sand. Olympius returns to the real world by pulling power from those demons previously defeated, along with a power boost from the Aquabase courtesy of a hypnotised Captain Mitchell. The end result is that Olympius gets destroyed and needs nursing back to full power by Jinxer. Queen Bansheera is finally at full strength, and she takes it out on both friend and foe. First by taking Vypra's lifeforce, then using Loki to trap the Rangers in the demon underworld. Carter isn't with the group, and runs into Olympius. Loki is destroyed by Queen Bansheera controlling Diabolico, and this scene actually makes you care for the villains in this case. They wanted nothing but to serve their Queen, but now she is back at full power, she's taking them out one-by-one and they don't like that one bit. Olympius and Diabolico fight, and the former delivers the latter to Queen Bansheera, who controls Diabolico again. The Rangers struggle to fight both of them, though Carter manages to break Diabolico from the control, and the two demons take each other out. Morphed to supersize, the Rangers bring out their Megazords, but all get destroyed in the battle, leaving them to use the one weapon they have left - the Lifeforce Megazord. Diabolico and Olympius are no longer problems, but the Aquabase is about to get a problem of its own. A Batling card placed on the Lifeforce Megazord means the creatures can spawn inside the base. The Fate of Lightspeed Part 1 does a great job of setting up the tension ready for the second part. The batlings run havoc inside the Aquabase, and outside it when they take control of the Lifeforce Megazord. Ryan has been captured, and Carter heads inside the demon underworld to rescue him. Queen Bansheera is getting ready to unleash her ultimate plan to bring all defeated demons back from the shadow world. 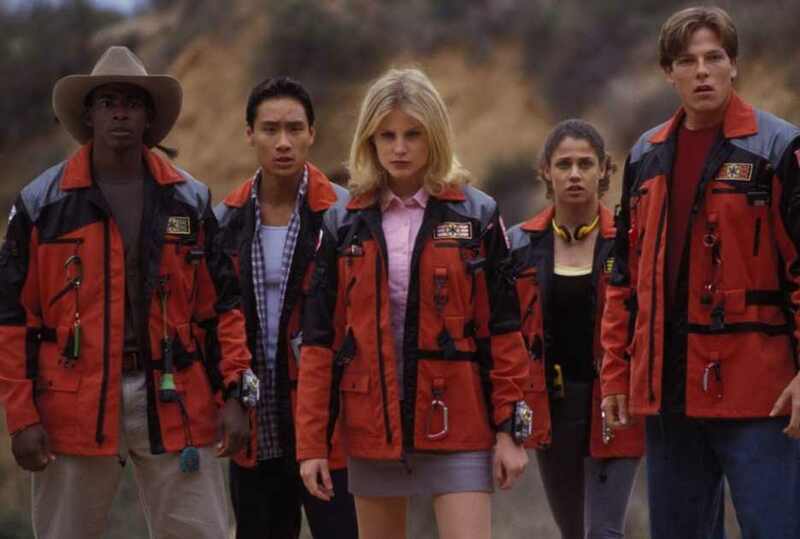 Jinxer has taken control of the repaired Omega Megazord to prepare the ceremony, and Captain Mitchell, Ms Fairweather, and the other Rangers take control of a submarine to evacuate the Aquabase, taking out the Lifeforce Megazord as they leave. Ryan and Carter do the same with the Omega Megazord. All the pieces are in place though, and all six Rangers head inside the Skull base to do one final battle with Queen Bansheera. The tomb is opened, and Carter pushes Queen Bansheera inside, though gets caught and dragged in as well. He manages to hold on, and Diabolico returns in spirit to help the Rangers one final time. Though the demons are gone, the Rangers are willing to help out in any way they can. Time Force opens with a battle between Red Ranger and Ransik in the year 3000. Time Force is out in full surrounding the building the two fight to make sure Ransik cannot escape. He is captured, and the court rule guilty for all his misdeeds. During the break before the decision was made, Red Ranger Alex proposes to his girlfriend Jen. Such is unfortunate what happens next. Jen, along with Lucas, Trip, and Katie, have the job of transporting Ransik to the prison. An ambush was set up to free Ransik by his daughter - Nadira - which succeeds, and the four transporters get relieved of duty. Ransik heads to the prison anyway, intending to free all the mutant criminals and take them with him to conquer the past. Alex shows up, and Jen watches as he is killed. It is up to the four to go back in time to 2001 and stop Ransik once and for all. Nadira robs a jewellery store, and the four of Time Force try to stop her. The morphers are not working, and they are outmatched. Jen fights against Nadira, and gets overpowered and held by two Cyclobots. Before they get a chance to destroy her, someone comes along on a motorbike and takes them out. Upon taking his helmet off, Jen gets a shock as the motorist looks an almost replica of Alex, and it is clear she still cannot face what happened to him. Once the motorist has gone, Jen follows him to the mansion he lives at once it becomes clear he is needed to activate the morphers. At first he is hesitant to join, but upon seeing what they are facing, Wes decides to join the four. Morphers active, the five become the Time Force Rangers and battle Ransik’s forces. Jen takes Wes’ morpher, saying he is no longer needed. This is a very strong opening. Beating even In Space in my eyes. It sets the main motivation for the Rangers to do what they have to, and Erin Cahill as Jen is already feeling like an absolute match. She manages the feelings of Jen so well, and other actors do their part as well. Ransik and Nadira are already becoming my favourite villains just from this two-parter, and when that happens, it is obvious a lot of care has been put into crafting them. The next episode introduces the Time Force Megazord, which can transform into two modes, as well as continues the struggle between Wes and Jen. Wes tries to take on Nadira on his own, causing the other Rangers to come to his rescue. Trip tells him the story of Alex and Jen back at the mansion, and Jen gives Wes one more chance to prove himself. He does that brilliantly, and becomes the fifth member of the team. As a nice gesture to the team, he finds them somewhere to stay – an old clock tower that used to house a small business called Nick of Time Odd Jobs, which the Rangers are happy to resurrect. Wes also learns of Ransik’s past, though he gets the full truth from Jen. We haven’t seen much of Mr Collins - Wes’ dad - and we get introduced to what he is like. He only cares about money, and what it can do for him, as we see when he hands over ten million to a business deal rather than to pay a ransom to save some kids. Wes takes matters into his own hands, and takes that money. Realising he doesn’t fit with his father, Wes leaves for the clock tower. When the Fatcatfish is released, Jen has trouble controlling her emotions, as this was the mutant set on destroying her and Alex back in the future. Frax sets up a trap so Jen is led to Ransik instead, and is almost killed. The mutant DNA of Ransik is playing up again, allowing the Rangers to take Jen away. In the last battle, Jen has the Fatcatfish at gunpoint, but Wes convinces her not to destroy him. I like all these interactions, and this feels the most real Rangers has ever got with them. There’s also feelings developing between Wes and Jen. And also the matter of starting to realise that their actions in the past will be affecting the future. First by a crystal being made by Frax that shouldn’t be invented for another 100 years. Then the fact that Mr Collins made use of a weapon that shouldn’t exist in this time. There’s also the fact the Time Shadow now exists in the future as well. Things start heating up around Silver Hills as a new force comes into play. Mr Collins has set up the Silver Guardians, a military force that helps the rich protect their property from the mutant threat. We are also introduced to Eric, an old partner of Wes from back at school, who seems to have something to prove – as he did back then. And it seems to have caused a rivalry for the two, especially when the Quantum Controller becomes available. The fact Wes is a Time Force Ranger is revealed during a fight to both Mr Collins and Eric, with the former not understanding his son’s decisions and the latter looking for a way to one-up Wes. That is when Eric steals the Controller during a fight, and takes it to a safe place. Eric asks for leadership of the Silver Guardians due to the current leader being out of action, but Mr Collins rebuffs him, effectively treating him as though he is nothing worth considering. The chase is then on for the Controller, with the mutants, Rangers, and Eric all heading to its location. With Eric in control of it, Wes tries to convince him this isn’t something he should get involved in. 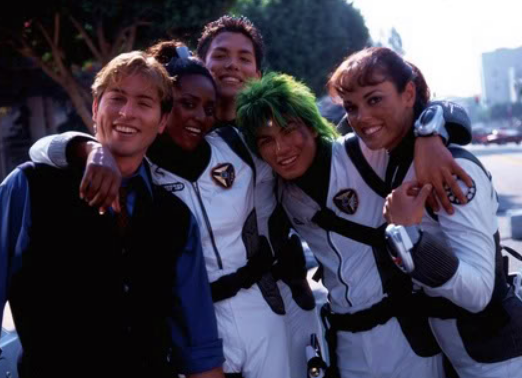 Eric becomes the Quantum Ranger anyway, and while the Rangers try to convince him to join them, all he wants to do is use his new Ranger status to become leader of the Silver Guardians, and give them an advantage with the Time Force technology. To do that, he needs the Q-Rex. Ransik releases a mutant to head back in time to control the Q-Rex. Eric and Wes do the same, though they end up fighting each other as well as surviving the Jurassic period. Owing to that, the mutant gets control and creates another warp, which Wes and Eric chase the mutant through. Eric manages to get control of the Q-Rex, and achieves what he set out to do. Mr Collins makes him leader of the Silver Guardians, though he failed to get the other Rangers on his side. Across these four episodes, I felt they had strong interactions throughout. Eric as a character is set up greatly, and it is clear that he believes he is better than Wes. Mr Collins’ research of the Ranger weapons is always going to run the risk of falling into the wrong hands. While that is the case with the next episode, it is resolved quickly and we also get to see Eric both confident and unsure within the space of a few seconds. He respects Mr Collins, sure. But seeing Mr Collins be so disregarding of the fact his lead researcher could have been hurt has got to be making Eric think. We also get to find out a bit more about Jen, and it is clear the bond between her and Alex is very strong. He was the one who mentored her just as she was about to give in, and she also seems to be conflicted with her feelings for both Alex and Wes. As Eric continues blocking the Rangers, Trip manages to find out why, and in a way Eric starts realising it. He feels different from everyone because he’s lonely. Has always been so. Jen starts to get through to him, as Eric withholds information about the Rangers from Mr Collins at her request. I haven’t talked about themes or opening title sequences during these posts, but from this point on Time Force has a change of sequence that I feel fits better with the overall theme. It also hints at the arc in which it is used from – that being Movie Madness. This two-parter is a completely nonsense plot that crams as many movie references into it as possible. There’s kung-fu, samurai, jungle, wild-west, musical, and quite possibly what I see as a reference to Michael Jackson’s Speed Demon Moonwalker segment. The two-parter takes things to a much more comical tone than most of the entire season, and it fits despite seeming as though it’ll be out of place. The future is brought into the past again as Jen’s first partner at Time Force is released and seeks revenge. Another mutant is causing everyone’s skin to boil, the same thing it did with Ransik, and the only cure is a serum that Ransik has control of. A few drops is all it takes for Bio-Lab to recreate it and help the city, but Ransik learns a truth. Frax is secretly a doctor that helped him all that time ago, waiting in robot form to exact revenge. The doctor showed Ransik compassion. All Ransik showed the doctor was hatred, having stole the serum and destroyed the doctor’s lab. Eric also starts to realise that helping people is a greater reward than gaining their money. He also starts joining with the Rangers in friendship more, bar Wes. Wes and Jen also realise they are close, and that really gets put to the test. Throughout the season, there has been a mysterious figure. He looks like Alex, though we never truly know if he is. When he heads to the past himself, and reveals himself to the Rangers, it certainly causes conflict within the team, and certainly between Wes and Jen. Ransik launches and all-out assault on Bio-Lab to gain control of the serum they made. Mr Collins stands up for Wes, and Ransik himself strikes him down. Eric stands off against Ransik but is no match, and when he sees Mr Collins getting taken away to the ambulance, he tags along to make sure he is going to make it. The Rangers defeat another mutant, and Alex reveals himself to the team. He takes over as Red Ranger and starts commanding the team, leaving Wes to take over from his dad – who Alex says will die tomorrow. As the team gets stressed by Alex’s command and Wes is missing being a part of the team, Frax gets one over the Rangers with his own super robot creation. The Rangers try twice to take it down and fail, leading the others to reproach Alex’s command. Wes stops Frax as he is about to destroy the team. Alex realises Wes should be the true Red Ranger and hands his morpher back. This arc is a whirlwind of emotion for the characters, and I love the powerful feelings it can evoke if you have been invested in them. Alex saves Mr Collins by handing him a life orb, and Wes and his dad finally have that understanding between them that shows a real bond between them. Alex leaves the future in Wes’ team’s hands. After such a serious arc, it’s time to wind down again with an undercover mission, and a mysterious box. Frax has intentions of turning humans to robots, which Jen and Wes stop. A black knight has come to town looking for someone pure of heart to open the box of the white knight. Just as Eric got his battliser by proving himself, so does Wes – from inside the box of the white knight. 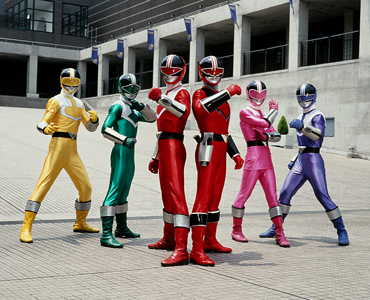 The Lightspeed Rangers team up with Time Force as Vypra returns with a new super demon to tackle the Rangers with. There’s not any real character bonding or even much interaction between the two teams except for at the end, but it is a good episode. The build-up to the end is coming, and the next few episodes slowly reveal all. Ransik is still furious at Frax, Frax is building a new robot to destroy the city, and it seems the future isn’t all that bright. With all mutants but Ransik now in containment, the Rangers face the prospect of returning to the future. Even when Alex warns them of the impending doom and order them back, they refuse. Nadira is starting to question the side she is on, and comes to the realisation that she doesn’t hate humans, it’s just been forced upon her by her father. Frax has been found and reprogrammed, and his new robot is unleashed upon the city. The Megazord is unable to be called upon, as the fabric of time gets distorted from the overload of the Trizerium crystals powering the robot and Q-Rex. Wes makes a difficult decision in sending the Rangers back to where they belong [or back to the future, if you prefer]. Wes and Eric fight through their injuries, and recover at the clock tower. They are found out, and overrun. Wes overloads one of the weapons still around and blows the clock tower up. In the future, the Rangers refuse to have their memories wiped, with Jen handing back the engagement ring that Alex gave her. Using the Megazord in jet mode powers through the time holes and saves Wes. Eric had been seriously injured protecting Wes and his dad, thanks to Wes finally getting through to him. The crystal in the Q-Rex gets neutralised, and Frax’s robot destroyed. Nadira questions the reason for the hate to her dad, but he has let it consume him and he attacks her. While he does battle with the Rangers, she helps protect a baby, hiding in a warehouse. Jen leads Ransik to that warehouse, where he strikes out and unknowingly hits Nadira instead. Jen comes up behind and attacks him, forcing him to see who he had attacked. Unable to stand that he had almost lost his daughter, he lets his hate go and turns himself in. Just as with the opening arc, the ending is just as powerful. Across three episodes, it feels paced right, and never has a moment that doesn't pay off in some way. An emotional end happens on the beach, with Wes and Jen finally admitting their feelings for each other. Mr Collins also makes an offer to Wes. He is to become the leader of the new Silver Guardians, who now protect all the people for free. Eric is to be Wes' second-in-command. I realise I'm falling ever more behind with these posts, but next time is a look at Wild Force and Ninja Storm. If you read my review of the 2017 movie, you'll know that I prefer most Disney seasons and how the series was handled under them. As such, these posts should start picking themselves up again.